Located at the base of the Texas Panhandle Plains, the Lake is a 7300-surface-acre reservoir created by damming Pecan Bayou. There is a wide variety of fish ranging from Large Mouth Bass, Small Mouth Bass, White Bass, Stripers, White Crappie, Yellow Cat, Flathead Cat, Perch, and Gar. Camping and boating is always great on this central Texas lake. 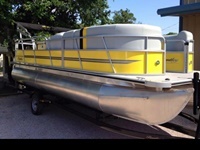 Lake Brownwood Boat Rentals have 22' Pontoon Boats, wake boards, knee boards, water toys, single/double kayaks all delivered to your dock or available at their location for half day or full day rental.